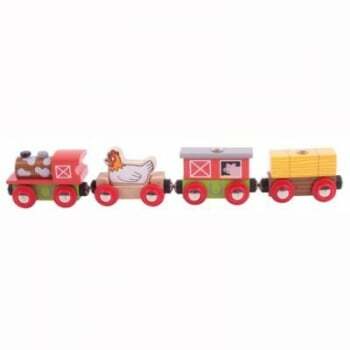 Children can join the chicken and pig for a countryside rail adventure onboard the Farm Train. Two of the carriages have magnetic points allowing them to be lifted off with the Hay Barn winch, enabling further imaginative play. Magnetic couplings ensure compatibility with all other engines and carriages in the Bigjigs Rail range. Most other major wooden railway brands are compatible with Bigjigs Rail.